Hello, It’s almost the weekend! Woohooo! Today over at Seize the Birthday our topping is ” It’s Just A Number.” Before I decided what I was going to do for my card, I got out some of my all time Favorite DP from Stampin Up to help me get my creative juices flowing, and it worked. A friend asked me to make her a card for her son that was turning 25 this month. The anchor is also from SU. The numbers were made with an olddddddddd Sizzix die. The button is MFT. Before I go I would like to welcome our new Surprise Party Guest for the next two months. She is very well known in the Card making blogosphere…..SonjaK. We are so happy to have you with us! You must visit her blog, she does fabulous work!! That is a great masculine card design and the papers are perfect for it. Very pretty masculine card. Love your card design and pretty papers. Very nautical, Nancy, and great for a young man. What a great card, Nancy! It’s nautical, masculine, age specific- this card has it all! Perfect for a 25 year old guy. I love this nautical card. it really does the trick for a masculine one. I always like nautical-themed cards, and this is a terrific one! The big numbers are fun. Great male number card, Nancy! I like the colour combination of red/navy/mint – very fresh. What a lovely design! Maritime cards are among my favorites and I’m totally thrilled by your clever use of patterned paper here. I’m never good at using patterned paper on cards, so I love to see examples like yours. So glad I’m chosen to participate as Surprise Party Guest for Seize the Birthday for the next few weeks. I love your great masculine card Nancy. The colors and design are fabulous. 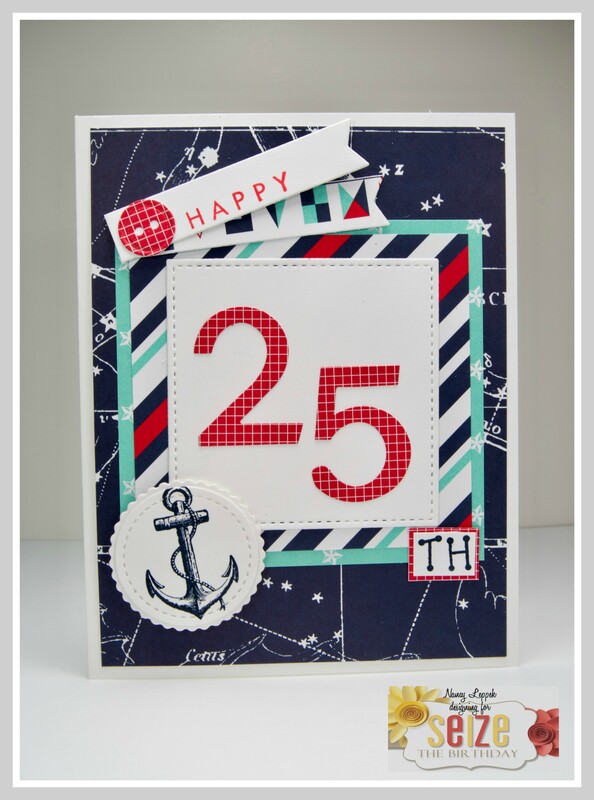 Great nautical masculine card with the pop of red, Nancy!!! Fabulous combination of the patterned papers! LOVE this. The colours and the theme are so perfect. So well done my friend.